The greatest composers in the history of classical music all wrote music for religious services or using religious texts. The Grand Rapids Symphony left the concert hall and entered the cathedral for the opening concert of its 2015-16 Sacred Dimensions Series on Saturday, March 5. 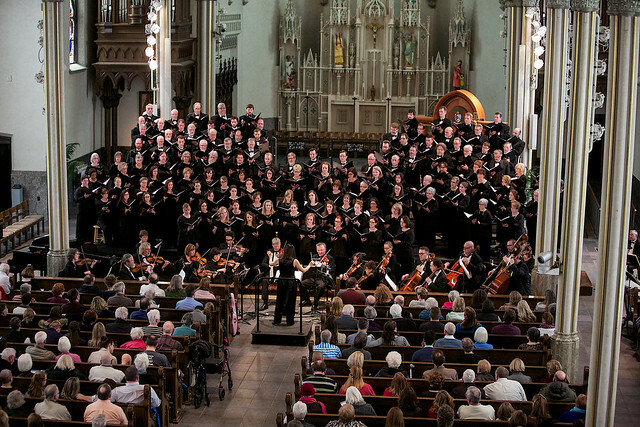 “A Choral Celebration,” featuring the Grand Rapids Symphony Chorus and the Grand Rapids Symphony Youth Chorus and Junior Chorus all joined the orchestra in the Cathedral of St. Andrew in Grand Rapids to perform music spanning several centuries from the medieval era to modern times. Pearl Shangkuan, conductor of the Grand Rapids Symphony Chorus; Sean Ivory, conductor of the Grand Rapids Symphony Youth Chorus; and Jackie Sonderfan Schoon, conductor of the Grand Rapids Symphony Junior Chorus, collaborated to lead two performances. Traditional melodies and work by unknown composers as well as great works of choral literature by G.F. Handel, including his Coronation Anthems “Zadok the Priest” and “The King Shall Rejoice,” were part of the program. Along with Handel’s Coronation Anthems, the 125-voice Grand Rapids Symphony Chorus sang “The Ground” by contemporary Norwegian composer Ola Gjeilo. The 91-voice Youth Chorus sang Gjeilo’s “Song of the Universal,” and together both youth choruses performed “Hope for Resolution,” composed by Ivory and by Paul Caldwell, a choral music director and composer formerly based in Grand Rapids. A contemporary setting of Ave Maris Stella by Mark Thomas, who served as director of music at the Cathedral of St. Andrew in the 1990s, was sung by the all-volunteer Symphony Chorus and Youth Chorus. The program ended with Gustav Holst’s “O God Beyond All Praising,” arranged by Nick Palmer, current director of music at the cathedral of the Roman Catholic Diocese of Grand Rapids. More than 270 voices sang the hymn, joined by congregation on the final verse.